Apple today made a quiet update to its iPod touch lineup, launching a new 16 GB fifth-generation model without a rear camera for $229. The new iPod touch, which is only available with a black front and silver back, replaces the fourth-generation iPod touch that Apple had continued to offer since the introduction of new models late last year. The new model is available now in Apple's online store and should be available in the company's retail stores starting tomorrow. Apple introduced the redesigned fifth-generation iPod touch last September with the same 4-inch display seen on the iPhone 5 and a number of other enhancements. But with the new hardware pushing the entry-level price to $299 for a 32 GB model, Apple decided to continue offering the fourth-generation models at cheaper $199 (16 GB) and $249 (32 GB) price points. Now, with production on the fifth-generation models having been underway for roughly eight months, Apple has found a way to shave costs through both natural component cost declines and the removal of several features to be able to offer a stripped-down fifth-generation model at pricing close to that previously offered for the fourth-generation models. Beyond the loss of a rear camera, the new entry-level iPod touch also omits Apple's "Loop" wrist strap introduced on the fifth-generation models last year. Earlier this year, KGI Securities analyst Ming-Chi Kuo had predicted that Apple would discontinue the fourth-generation iPod touch in favor of a stripped-down fifth-generation model without a rear camera. Kuo had believed that Apple would introduce an 8 GB version of that device for $199, but Apple apparently decided that 16 GB of storage should be the minimum for the iPod touch lineup. Like what the heck - really doesn't make any sense. WWDC is in 2 weeks! 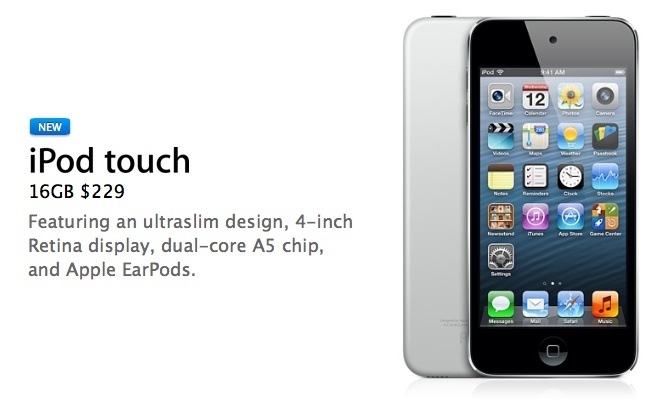 Why would they waste time at WWDC talking about a cheaper iPod? would love an iphone with a black front and silver back. This can be taken to places now where no cameras are allowed, such as court rooms, government facilities, etc. It still has a camera. You've just described the original iPhone. Yeah that would be a bit underwhelming. "Here's our latest product, we've removed the camera and halved the storage capacity. Moving on..."
Well I did not see this coming. What do you think will be announced at WWDC? iOS 7. What do you think it will run on? Probably any iOS device with 512+ MB RAM (that excludes the 4th gen iPod touch and iPhone 3GS). That would mean that, just like last year, the cheapest iPhone/iPad/iPod they still sell at the time the new iOS is announced are also the minimum devices to support it. Not offering software compatibility for hardware that is still being sold gives a bad impression of planned obsolescence, and it's exactly what would have happened if the 8GB 4th gen iPod touch was still being sold. Seems a bit like fragmenting the products... I think its pointless. A lot of apps now have camera features in, people will buy this and then realise it has no camera.